Meetings & Conventions brings the challenge of event planning to the highest professional level. At the forefront of industry trends and developments, our deeply engaged audience of 50,000 professional planners, representing the most highly sought corporations and vital associations, maintains a powerful influence on all aspects of their meetings and programs. Specifically targeted to the full-time, strategic meetings manager, M&C’s monthly print magazine, website, e-newsletters, blogs and other products all take an enterprise-wide approach to the responsibilities of selecting key supplier partners, writing and enforcing smart policies and procedures, enlisting support of the C-suite, proving return on investment and much more. Our readers are the market’s thought leaders, aiming to employ and share best practices among a fast- growing cadre of peers and partners. Over 95 percent of M&C readers make decisions regarding destinations, hotel and venue selection, planning an average of 15.2 meetings per year. Our readers represent over $3 million in potential buying power per planner. Recognized as publisher of the industry’s most sought after and groundbreaking research, M&C dominates the market. In addition to providing premier industry-wide studies, M&C offers syndicated and custom research programs. Targeted supplements provide current information and trends on destinations, unique venues, activities and more. M&C’s leading industry hosted-buyer events support the engagement of the industry’s highest qualified full-time meeting professionals. Our popular events feature face-to-face, pre-scheduled, targeted appointments; networking events with all attendees and peers to build relationships; and a solid ROI when you meet directly with planners who have business to book in your market. For more information on Meetings & Conventions, visit MCMag.com. PGA Magazine, published by PGA Magazine Publications & Marketing Group, is your direct connection to the most influential and important people in golf: PGA Professionals. They are 27,000 strong. They are golf’s most passionate and best-educated spokespeople. And because PGA Professionals enjoy unparalleled day-to-day interaction with millions of golfers as they teach, sell, manage, play, and grow the game, they have unparalleled influence.  The most extensive and informative platforms for golf ranges: The Golf Range Association of America (GRAA), its publication Golf Range, and golfrange.org The #1 regional golf publication globally, The Met Golfer, published on behalf of the Metropolitan Golf Association in the Greater New York area. Vanguard Pro Shop, the leading e-commerce solution for private golf clubs and golf resorts. For over 20 years we’ve helped small brands stand out, new brands launch, and strong brands both defend their positions and increase their sales. Call us ... we look forward to helping your company.